Lake Superior while a large body of freshwater, is dependent on other sources to keep a sustainable level. If the rivers that drain here do not have enough snow melt at higher elevations, and if the usage from resorts, cabins, homes, is consistent or increases, over time the level is going to drop noticeably. Soon, artifacts from shipwrecks and ancient people will litter an increased shoreline. If the climate continues to change in patterns with higher temperatures and more extremes, and if we are unable to adapt quickly enough, this inland sea may disappear. This makes sense to me, and is concerning as I watch the sunrise through a fog laced Sunday morning and nothing but calm and peace overlays the chaos within. I try and think of not thinking and allow the layer to seep further into unseen depths, but it is blocked by more questions that I formulate while sitting by the window overlooking a staircase leading to the sandy beach. I now see the contradiction and struggle of capitalism and environment, and the need for more revenue, in this economic crisis. 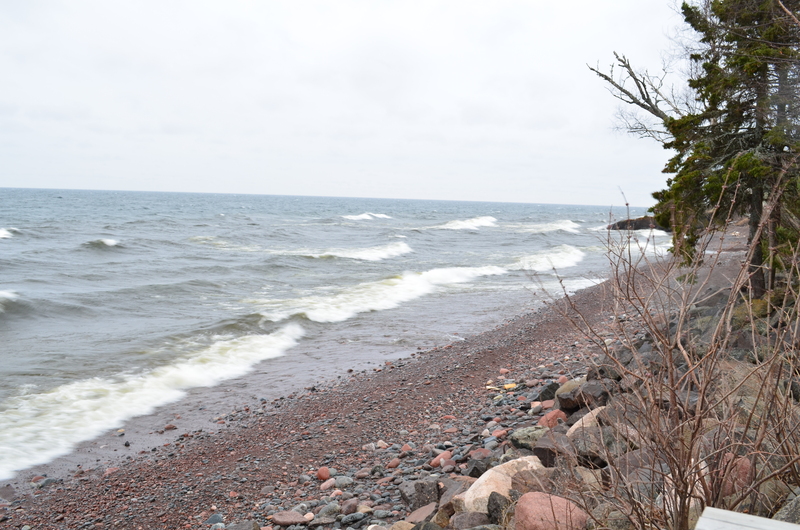 While the water level and purity of Lake Superior are critical, so is the revenue for the city and county, and the continued trickling upwards. Money can buy almost anything, and in these hard times it can buy everything. If a hold was placed on building additional structures around the lake, and limiting the amount of water that can be drawn from its source, cash-strapped cities would be willing to bend and look the other way, if enough money was offered. It can be justified, and the self is placated, to say that we are working on solutions in the long-term. In the scenario, the cycle is continued and intensified. The environment is further damaged and sacrificed, but not yet quite in obvious ways to the untrained eye. However, there is a limit to natural resources, and over time, the lake will give in and leave this land, lowering the values of existing properties, decreasing demand for a piece of this land, further reducing the revenue for the city and county. This entry was posted in Essay, Nature and tagged awareness, being, conservation, lake, nature, superior, water. Bookmark the permalink. ‘Contradiction and struggle of capitalism and environment’ – Superb. Thank you for the kind words, Mari. It ends. Humanity appears to be intent on destroying itself, by not seeing what happens to the environment ‘out there’ is in fact what happens ‘in here’. I don’t think we are going to see significant change in our lifetime but let’s continue to hope and do our part. That’s all I know to do. It hurts the heart to see our natural affected this way. There are things I knew as a child that now, my grandchildren will never know or experience. We can only do our part each day, and not get discouraged by small changes. We have to keep in mind that each builds upon the previous, and looking back further down the road, we will see a large change. But it is one step at a time.